The study estimates that ‘excess’ bank deposit growth (y-o-y) following demonetisation has been in the range of 3.0-4.7 percentage points. 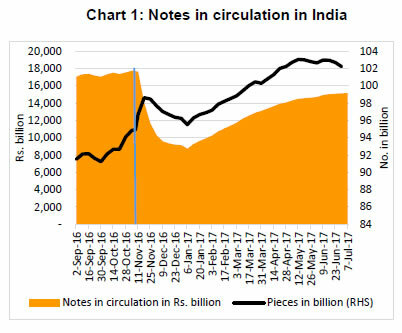 In nominal terms, these estimates imply excess deposits that accrued to the banking system due to demonetisation to be in the range of ₹ 2.8-4.3 trillion. A micro-level analysis of unusual growth in cash deposits in specific types of accounts, which are usually marked by low level of activity, also support the findings. Such gains in terms of shift towards bank deposits, if durable, could have beneficial impact in the form of financialisation of savings. Against the above backdrop, this study attempts to analyse deposit ‘behaviour’ with a view to estimating ‘excess’ deposit growth due to demonetisation. First, employing certain assumptions, a time series model is adopted to assess the ‘normal’ rate of growth in bank deposits during the demonetisation period and then ‘excess’ growth is derived juxtaposing it with actual growth. Second, seven categories of special accounts constituting about 30 per cent of bank deposits are evaluated against the growth recorded during previous years. Such accounts are selected given the lack of significant activity in these accounts during normal times and indications of unusual cash deposits. The resulting estimates are presented below. In what follows, the benchmark nominal rate of deposit growth is assumed under alternate scenarios to be (i) the deposit growth in the corresponding period of 2015-16; (ii) the average growth recorded during the corresponding periods of the previous two years (i.e., 2014-15 and 2015-16); and (iii) the growth estimated using ARIMA model. Aggregate deposits grew by 14.5 per cent (y-o-y) during the period November 11 to December 30, 2016, as against 10.3 per cent during the corresponding period of 2015, indicating a 4.2 percentage point excess deposit growth due to demonetisation (Table 1). In nominal terms, excess deposits work out to ₹ 3.8 trillion. Assessment for the period November 11, 2016 to February 17, 2017 reveals that average fortnightly bank deposit growth was 13.9 per cent, 3.5 percentage points in excess of the assumed normal growth of 10.4 per cent during the corresponding period of 2015-16. With a view to factoring in some temporal tapering of deposits, if the period up to end-March 2017 is considered, the actual deposit growth of 13.4 per cent exceeds the estimated growth of 10.1 per cent by 3.3 percentage points. Note: Due to fortnightly reporting system, data have been taken from the fortnight ending November 11, 2016 to capture the impact of demonetisation. The average fortnightly y-o-y growth in bank deposits during November 11-December 30 of 2014-15 and 2015-16 was 10.6 per cent, while the average deposit growth for the same period of 2016-17 was 14.5 per cent. Under this scenario, excess deposit growth due to demonetisation is estimated at 4.0 percentage points (Table 1). On the same basis, deposit growth for the period November 11 to February 17, 2017 was 3.3 percentage points in excess of the deposit growth of 10.7 per cent based on average of the same period of previous two years. If the period up to end-March 2017 is considered, the excess deposit growth works out to 3.0 percentage points above the average deposit growth of 10.4 per cent. where, ŷt is the deposit growth series. Lags of the series (yt-1,…, yt-p) are ‘autoregressive’ terms, while lags of the forecast errors (et-1,…, et-q) are the ‘moving average’ terms. The model is found to be statistically robust and apposite for short-term forecast (see Annex Tables 1 to 4 and Annex Chart 1). The excess deposit growth due to demonetisation using the model works out to 4.7 percentage points over the model forecast growth of 9.8 per cent (Table 1). For the period November 11, 2016 to February 17, 2017 deposit growth was 4.2 percentage points in excess of the model forecast growth of 9.7 per cent. When the period up to end-March 2017 is taken into account, the excess deposit growth is 3.8 percentage points over the model forecast growth of 9.7 per cent. Before the discontinuation of over-the-counter exchange facility at bank branches on November 25, 2016, about ₹ 370 billion of SBNs were tendered. A significant amount of SBNs flowed into the following special types of accounts: Basic Saving Bank Deposit Account (BSBDA); PMJDY Accounts; Kisan Credit Card (KCC); dormant or inoperative accounts; co-operative banks’ accounts with SCBs; bullion trader/jewellers’ accounts; and loan accounts. The amount of unusual cash deposits has been estimated below using data on these accounts and the following estimation methods. Estimated cash deposits in these seven types of accounts during November-December 2016 with 52 banks were ₹ 4,358 billion. Cash deposits in these accounts during September-October 2016 were ₹ 2,701 billion (Table 2). Thus, the variation of ₹ 1,657 billion can be assumed to be the increase in cash deposits under these accounts due to demonetisation in the absence of any noticeable activity in such accounts during normal times. The estimated cash deposits in seven types of accounts with 52 banks were ₹ 4,358 billion during November-December 2016 and ₹ 3,065 billion during November-December 2015. Average y-o-y growth of net deposits (deposit minus withdrawal) of all types of accounts of SCBs during November-December for last 5 years was (-) 9.2 per cent (Table 3). The estimated trend of cash deposits in these accounts during November-December 2016 is ₹ 2,783 billion. Thus, excess cash deposit during November-December 2016 works out to ₹ 1,575 billion. Note: Net deposit is the difference between deposit and withdrawal. Excess deposit growth in the banking system during the demonetisation period (i.e., November 11, 2016 to December 30, 2016) works out to 4.0-4.7 percentage points. If the period up to mid-February 2017 is taken into account to allow for some surge to taper-off, excess deposit growth is in the range of 3.3-4.2 percentage points. 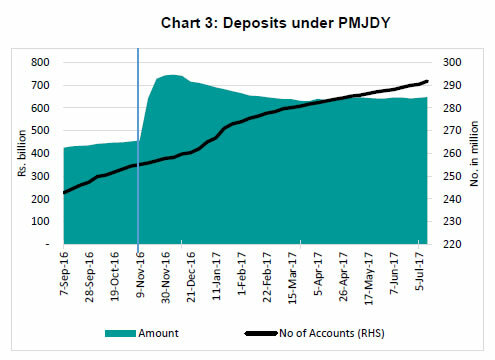 Considering some more temporal tapering of deposits, the exercise taken up to end-March 2017 reveals that excess deposit growth would be in the range of 3.0-3.8 percentage points. In nominal terms, excess deposits accrued to the banking system due to demonetisation are estimated in the range of ₹ 2.8-4.3 trillion. The unusual cash deposit in specific accounts, which are usually less active, is estimated to be in the range of ₹ 1.6-1.7 trillion. 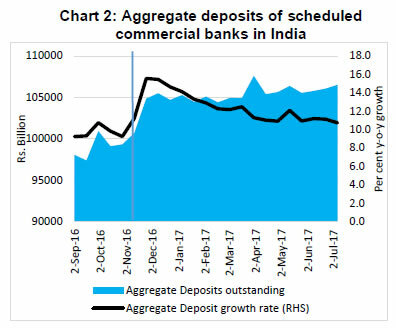 Overall, there appears to have been a significant increase in bank deposits due to demonetisation, which if sustained, could have favourable impact on financial savings and their channelisation to capital markets (See Mint Street Memo No.2: “Financialisation of Savings into Non-Banking Financial Intermediaries)”. Note: Test critical values are: -4.01 at 1% level, -3.43 at ** 5% level, * -3.14 10% level. Note: All Q-statistics are highly insignificant suggesting no serial correlation left in the residuals. 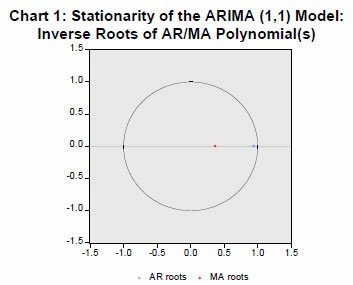 Note: If ARMA process is (covariance) stationary, then all AR roots should lie inside the unit circle. 1 Bhupal Singh and Indrajit Roy are Directors in the Monetary Policy Department and Department of Statistics and Information Management, respectively. The findings and views in this paper are entirely those of the authors and should not necessarily be interpreted as the official views of Reserve Bank of India. 2 Another important outcome of demonetisation has been the considerable increase in use of digital transactions with prepaid payment instrument (PPI) volumes increasing by 44 per cent between November 2016 and June 2017. Box, George and Jenkins, Gwilym (1970), Time Series Analysis: Forecasting and Control, San Francisco: Holden-Day.